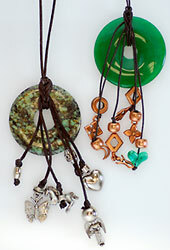 Learn how to embellish a disc with cord, beads, and charms. Learn a simple decorative spider knot along with the ever popular slip knot. Choose from our selection or sort through your jewelry box for unique charms, fetishes and dangles. Please bring all the materials to class with you.